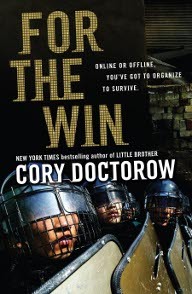 [tweetmeme source=”mypassionisbooks” only_single=false]Over the last six or so months, I have read the books Little Brother and Makers by Cory Doctorow, and now, I am reading his brand new (Released yesterday, May 10, 2010) book called For the Win. Cory has really come into his own now. These last three books, I believe are his crowning achievements….to date. I will get back to Makers and Little Brother in a bit, (Little Brother was Cory’s first YA – Young Adult – book) because they were really good, but for now, I want to focus on Cory’s new YA book that he just released yesterday, For the Win. Which for the sake of honesty, I have to say, I have not completed as yet but will soon – you bet on that! But I didn’t want to let another of Cory’s book release weeks go by before I posted about it. Purchase from various locations from Cory’s site here. Amazon has the hardcover book available for a discounted $12.23 (reg: $17.99), and it’s eligible for free shipping. Now that’s a good deal for a hardcover book. Or do what I do, download the free ebook and then decide. I didn’t want to wait to get the hardcover book or audio book to begin reading, so I downloaded the free ebook version (epub) from Cory’s site here, and am already hooked on reading this book — and I have only gotten a few chapters into it. I also listened to the wonderful free sample from Random House Audio audiobook version linked on Cory’s page here (available DRM-Free! from Cory’s site for $29.00). The For the Win audiobook runs 16.5 hours and is formatted for burning onto 13 CDs. Sample here. I can’t wait to get either the hardcover book or the audio book version. After hearing the sample of the audio book, it’s making that original decision to get the hardcover, a really hard decision. I know I would prefer the audiobook version, especially after hearing the reader/narrator. Hey, what am I talking about, I can’t even wait to finish the free ebook. In the end, Makers feels like a personal, cultural, and literary milestone: an employment of the full literary toolbox of SF, in the service of a portrait of how the world actually works. If only every genre author set out with the same high ambitions, there would be no talk of SF’s failures, only triumphs. Purchase from various locations from Cory’s site here. Amazon has the hardcover book available for a discounted $16.49 (reg: $24.99). Or the audiobook from Cory’s site here. The DRM-Free Makers Random House Audio audiobook runs 18.5 hours and is formatted for burning onto 15 CDs and costs, $27.50. Sample here. Or again, you can do what I do, download the free ebook and then decide. Makers is amazing. The intricacies, the diversity of characters involved and so many locations! This is one big book. It was an amazing book. It must be amazing inside Cory’s mind. I have heard Cory speak so many times and he is so excited about life and his passions — he just downloads all he can into a small space of time. In this book, he kinda does the same thing, although he gives great attention to detail, he’s not rushed, and he manages to hit on so many aspects of his main and secondary characters’ lives in this failed economic system where people still need to eat, to live, to work and play. He gives such genuine feelings to their triumphs, losses and all kinds of real life events in truly horrific physical and economic conditions. Cory shows so well how the best and worst of people come out, and ultimately how these very types of situations can actually foster deep innovation and commitment on so many levels. Although there were some very hard parts of the book (meaning hard to deal with because you get to know the characters), the book still left you feeling good about life. 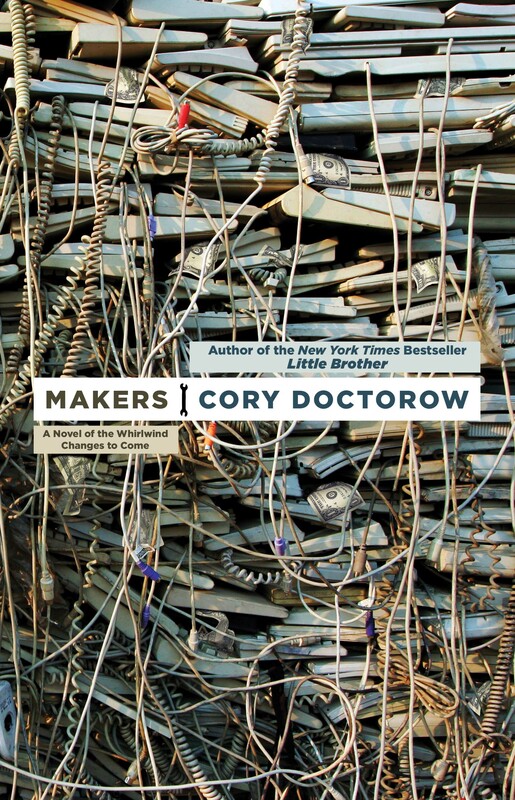 EDIT 6-23-2010: Locus Online News reports Cory Doctorow’s Makers is one of the 2010 John W. Campbell Memorial Award Finalists! Congratulations Cory! Purchase from various locations from Cory’s site here. Amazon has the hardcover book available for a discounted $12.21 (reg: $17.95). You can also buy the audiobook version at Amazon here for $36.48 (reg: $48.00). Or as I mentioned previously, you can do what I did and download the free ebook first and then decide. 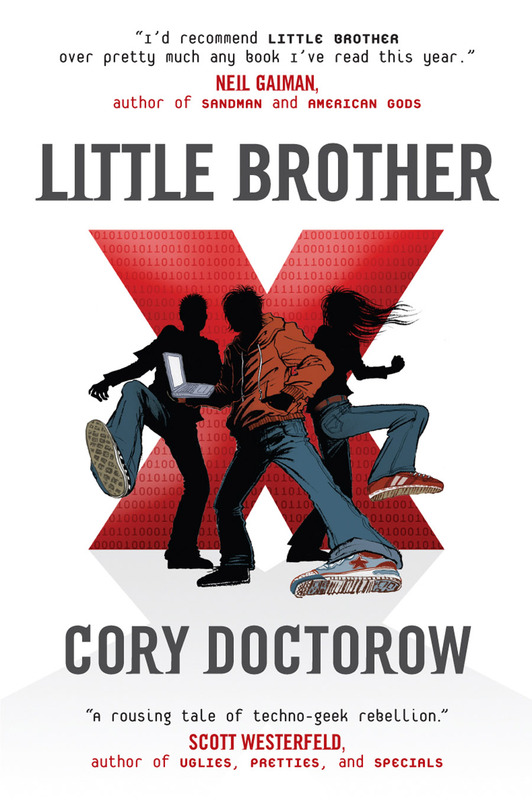 I’d recommend Little Brother over pretty much any book I’ve read this year, and I’d want to get it into the hands of as many smart 13 year olds, male and female, as I can. I thoroughly loved this book and have already purchased the hardcover book for the library here at home. And would love to also get the audiobook version. No matter what age you are, you will feel for Marcus, aka w1n5t0n, and his circle of friends and what they all go through, and what their families go through in this book. George Orwell would be proud of this book — done in an updated style, and as technically detailed as his own 1984 in many respects. I too would recommend this book to anyone in the Young Adult range, but I would go further and say that anyone, any age who is even the least bit geeky will love it. I remember thinking that this is Cory’s best work yet. And one so needed in today’s world.